It's that simple and that practical. Built entirely from 3″ square tubing and fully welded. It's ..
Y-shaped Frame Unique shape of olympic flat bench frame allows spotter close proximity to li.. The Legend 3102 Decline Utility Bench gets the job done, and done well. The strategy remains simp.. It's all about the workout! But you need good tools also, and the Olympic Incline with Plate Stor..
Adjustable Leg Pads To accommodate a wide variety of users, leg pad on olympic decline bench..
Expect nothing but the best from the Legend 3104 Multi-Purpose Bench. A necessity for dumbbell wo.. Substantial proportions of big steel and rock-solid construction define the Legend 3156 Olympic S..
Y-shaped Frame Unique shape of olympic incline bench frame allows spotter close proximity to .. The Legend 3103 Three-Way Utility Bench needs no explanation. Simple? Yes. Plain? Hardly. It adju.. It's hard to improve on a classic. Throw in a wonderfully substantial plate storage system and se.. The Three-Way Utility needs no explanation. Simple? Yes. Plain? Hardly. It adjusts from 0 to 90 d.. 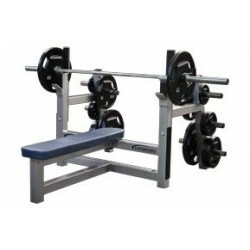 Solid as granite, the Legend 3105 Olympic Flat Bench is the simplest way to facilitate chest burn.. Multiple Seat Positions Adjustable flat bench includes backrest that tilts from -5 to 80 degr..
Has a utility bench ever been this versatile? The Legend Four-Way Utility Bench hits all the stop..